Is this job found by baiblysteanna? or this is just spam? hm, I didnt got message for your reply. I think you opened link for pythone scripts. GUARDIANS PARTY for 1.01. DX9. I think you must follow this link. Are you Deathincarnatelolz ? Tarot lover? I'm new here. I've been browsing tons of forums for an idea of what to do. I was laid off from my job about 3 month ago. I've been looking for a job since then, but did not even get a single interview. I worked as a web designer for a publishing company for the last 5 years. Looks like mbx.streetofeyes.com is an active forum with active members and may be someone has some experience working as a freelance web designer. May be "Guardians Party EX" category is not the most appropriate for this question, but I want to try anyways to get some opinions before I go ahead with my life. I'm wondering if it is possible in the current economy to find work for a freelance web designer and make enough to pay for rent and groceries. I was able to find a small project on craigslist and I developed a website for a company. It was a small project and took me only a week to complete. I got paid $800 for 1 week of work which is not bad. Please people give me some ideas. I have 2 kids and my wife is out of work as well. Thank you in advance. You are right this is absolutely wrong place. I'd like to help you if I can. I got much less money for a week, indeed it is more like my month money, well, close there. And I unfortunately don't know nothing about web designer work. I can only say, that I was unemployed many time, and I work all I got. I don't know how it is in your county, but in mine, every day more houndreds workers loose their jobs. I believe that it is hard, but I can only wish you to fast find new job. Or at least better place for such questions. Hi all. I am a new here at this forum. I just have started to play this mod and it seems to me it is really amazing. It's something new and refreshing after playing of endless variations of the mostly the same native mods. I will be surely having some questions about various things in this mod and I hope somebody will advise me here from time to time. Most answers you will find in this subforum already posted. Have a good time and thanks to put some screenshots upper. Guardians Party / Re: Merging mods?? Hey guys i want to ask a question.. Lets say that i download the sword of Damocles and the Guardians party mod.. Is there any way to play the Sword of Damocles, and to be able to use some items from Guardians party? What i mean is, can i mess with the files so i can play the Sword of Damocles and when i go to the marketplace, for example, buy an armor which is from Guardians party? i really like the weapons and armors from Guardians party and i 'd love to have them in Sword of Damocles..
Of course it is possible. That's what we call moding. I still don't know who is maker of the things. What is original, what is compilation, what is borrowed. And compilations of things is not what I understand as origiinal work. Sorry. And as you can saw, I moved from here for a while. Lack of time. Anyway, I would like to talk with qq163it first. We can use online translators. I'd like to thanks to all who help or play this mod. Especially I'd like to thanks Winter for this place. I working now with new team on Daydream project. And since this mod (GP) need so many work to repair things that it will work fine 1.011 and because I don't have time for double work I will leave Guardians party for a while. I was thinking that I will take some highlights from this mod with me. You can tell me which things you like most and which you like to see in my new project. If there is someone who want to work on this mod (GP), I post last version and module system. He is welcome. If you want to use some things from Guardians Party in other mods, ask me first. Some things are mine, some just borrowed. I will not complicate about staff, but ask me first. OK? Will Winter move this topic to Dead/Hibernated mods? I will leave this decision to him. If you need me, you can find me on Talewords forum. I am sorry for that, but don't buy flintpistol. I dont know is such weapon is in native brf. If not, it is posiblle reason to crash the game. Well Mahliqa sell all from list, even no one use such item for a long time ago. I remember this weapon from 751. but ater that I never try to find it. It is there, but who know. As I said, I must rebuild modul system all over again to adjust things to new version. As it is now it is too bugy. OK. I prepare porting to 1.010. I partly prepare one face for 1.003. They need also animations i.e. variations for different characters, same as native faces. And current version cant use helmets as heads. 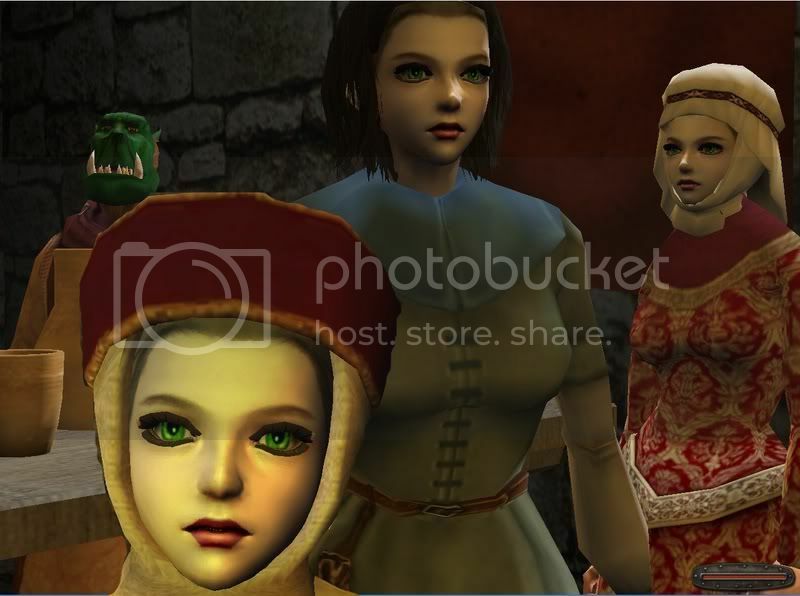 They are removed in dialogs and in castles.... We don't like headless beauties, don't we? Also hairs are not prepared jet. Can you ask qq163it if it is possible to use - faces only - there. I can't get it on mail. It is nice project. All what I do right now is there. I was thinking also about another option. I can use characters from this mod also as heroines members of the sacred order who will join your party. Thanks for translation. My undestanding was wrong, when I hope that he talking about already done work. Tell to qq163it that I am gratefull for his contribution. Can you tell me about author of mod. He/she is qq163it? He prepared all models there? Such things I must know to credit it. OK? It is mod for 0.894 or some other version? Khm, I can not translate this. I have some problems. The file looks corrupted. I got out textures. But there is no brf files with meshes??? My downloaded file have just 14 mb but it must have 54? I will try to download it again. Ah, now I got other files. I hope it will works now. I don't have such permissions. This is good idea. I must confess that I newer play BOW. It is easy to make factions, but what kind or role they will have. How it is in Baby Cat Mod. Tell me about dresses and armors. Some of them looks like toked from lineage. They are one piece models? Why all faces are same? But tell me is this mod published, or boycott stops work on it? And if not, it can be published and discused in other forums. My friend opened new topic in talewords for our notes. I show him these pictures there. Peoples talk more about this pictures than other things there. Any way. Talk with authors. Let we see, what we can do. A new Mod just popped out in M&B Chinese forum. It is called Baby Cat(?). A feature about this Mod is the extreme good looks of different troops. Some samples are listed below. Maybe you have interest in importing those faces into "the Guardian Party" in the future. I have many native armors fitet for girls. As on first picture. If boys are preparing to share something, we can exchange some models. But you know how is my china language. Can you help me to make some contact with someone who speak english there.